If you’re anything like me you have unfinished artwork lying around, either on your hard drive or in your desk, or art studio. It seems I have ALOT of unfinished work. I’ve spent the last few days going through it and deciding what I want to trash and what I want to either finish or rework. This old 3D poser render caught my eye. It’s been sitting around for over a year now. 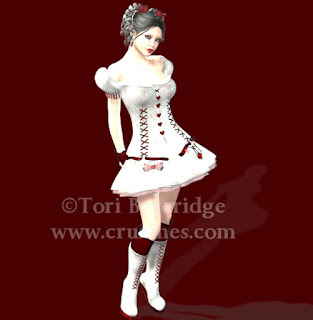 Original Poser 7 render, background was added as contrast to the white. It was named Valentine Doll and was in .png format. I had done it to make a Valentine’s Day piece of art. I decided to work with her, even though Valentine’s Day is long past or a long way away. I tried a few different backgrounds and elements, sticking with the Valentine theme. Errrr… no… this isn’t working! Even if I touched her up, added heels to her boots, I knew I wasn’t going to be happy with her. For one thing, the lighting I had used in Poser had blown her out. I understood why she had been sitting unfinished for so long. I was going to trash her and move on to something else, when I had the idea to use her only from the shoulders up. The lighting became much easier to manage. 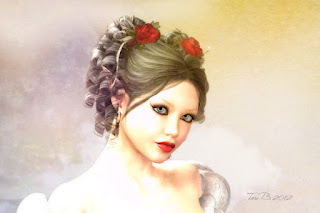 Her red lips and the red roses in her hair became a focal point. The whole picture took on a much more romantic look. I named her Rose Red, after the fairy tale character, who although not a fairy, might have looked like this if she had been. You can view a larger version of Rose Red in my gallery . Prints are available there also. Other products will be in my Zazzle store soon. 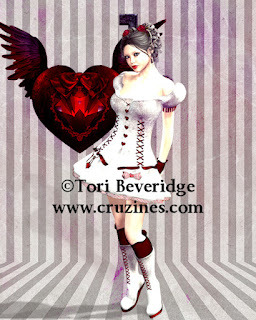 Posted in Tori Beveridge and tagged art, Cruzines, digital art, fairies, fairy, fantasy, Poser 7, Tori B, work in progress.